I hosted a lunch for an entrepreneur and his advisors downtown. 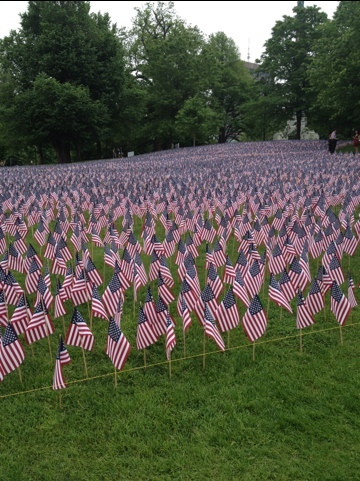 During the walk back to the car, I walked by a sea of U.S. flags on the Boston Common. It was immense. The picture I took and show below doesn’t show the scope. A sign stated that volunteers put down 33,000 flags, one for each fallen Massachusetts soldier who has died since the Civil War. God’s peace to those soldiers. A peaceful and safe holiday for all….